Ozodlik says Ikhtiyor Abdullayev was found to have been tapping the president's phone. The head of Uzbekistan’s revamped security services has been removed from his post — on health grounds, according to official sources. But RFE/RL’s Uzbek service, Ozodlik, has reported that Ikhtiyor Abdullayev, 53, was actually fired and has now been made object of a criminal investigation. The broadcaster has cited three anonymous sources close to the government as saying a dozen people working under Abdullayev have been arrested. 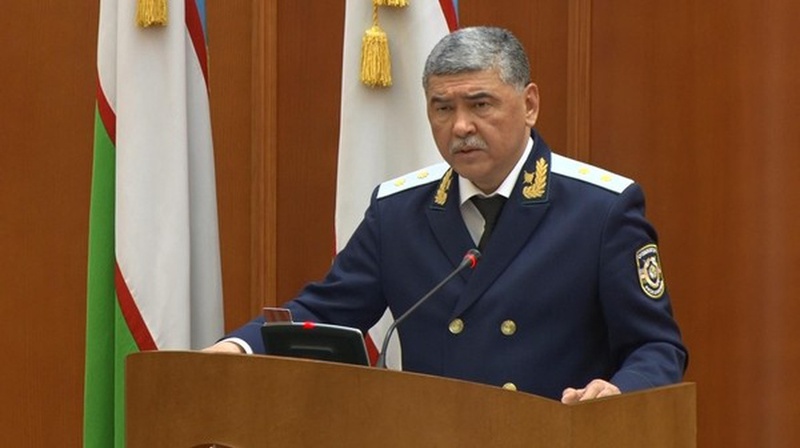 A state-run news agency reported on February 11 that Abdullayev, who had headed the State Security Service, or SSS, for just one year, has been replaced by outgoing Defense Minister Abdusalam Azizov. In its explanation for this personnel reshuffle, Uza stated that Abdullayev had undergone two serious back operations over the past year. The security services underwent a major shakeup at the start of 2018, when President Shavkat Mirziyoyev made a move many had considered risky by firing hardliner Rustam Inoyatov, who ran the agency as a relentless machine for repression for 22 years. Inoyatov’s removal paved the way for the substantial dilution of the body. In a symbolically freighted move, even the name of the organization was modified — from National Security Service to State Security Service. In November, the body’s headquarters were moved from the center of Tashkent to more modest premises on the outskirts of the city. If Ozodlik’s reporting bears out, however, even these adjustments were not enough to ensure unconditional loyalty. The outlet’s sources state variously that Abdullayev is suspected of bribery and abuse of office. The case against him was reportedly opened on February 8 by the Military Prosecutor's Office. Moreover, Ozodlik says that its sources say that Abdullayev fell out of favor after it was allegedly discovered that he was tapping the president’s phone calls and conducting surveillance on the president’s family. This could all be grist to the mill of those unhappy with the extent of reforms to the security services. The SSS is still an intensely closed and secretive body that is not required to report to parliament. Its chairman is appointed and fired by the president. Nevertheless, Mirziyoyev was successful in minimizing the body’s role in conditioning society and the media. He removed security service agents posted in diplomatic missions abroad. Media has been permitted tentatively to engage in more robust, public interest reporting. Many political prisoners and long-jailed rights activists have been released from prison. And the government has nominally ditched the practice of keeping blacklists of people believed to belong to pious Islamic movements. But it appears unlikely that suspicions of palace plotting is likely to do much good to this highly incremental liberalization agenda. A more probable scenario is that Mirziyoyev will tighten the ranks and that a mood of suspicion and paranoia could once again deepen among the uppermost elite. Azizov, the freshly appointed 59-year-old SSS chairman, is known to be a trusted loyalist to President Mirziyoyev. His career has flourished in the last couple of years. In January 2017, he was named Interior Minister and was then moved to the Defense Ministry in September that same year.